Charles Godfrey was Music Hall's greatest advocate of the dramatic song. He had experience playing melodramatic roles on stage and used this in his portrayal of characters such as the dejected old soldier. 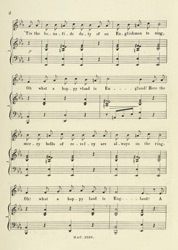 He used songs such as 'Oh What a Happy Land Is England', to remind his audiences of the nation's glory and to encourage them to be proud of their country. Singing this kind of song was a way of involving the audience in the act. It reinforced a sense of identity across the classes at a national level; choruses were catchy, costumes patriotic and everyone could sing along.